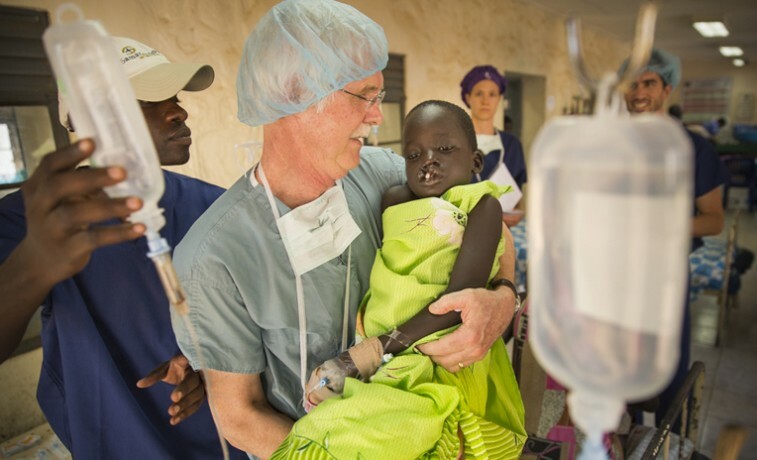 A multinational Samaritan’s Purse medical team provided free-of-charge cleft lip surgery to more than 50 South Sudanese people, most of them children, during the first week of November. Two cleft palates were also repaired—believed to be the first such surgeries ever completed in the country, which achieved independence in 2011. This is the fourth consecutive year Samaritan’s Purse has offered this program, despite the new nation’s difficult circumstances. Our mission aviation team based in East Africa Give To Help Repair Cleft Lipsplayed a critical role in the program, conducting no-fee flights that brought many of the patients from remote areas to the hospital in the capital city of Juba. South Sudan has few good roads, transportation when available is prohibitively expensive for the majority of people, and numerous areas are too dangerous to travel through anyway because of ongoing ethno-political violence. 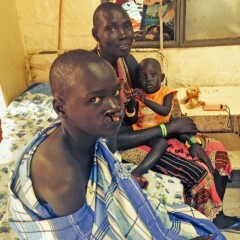 A baby born with a cleft lip is usually seen as an evil omen in South Sudan, a frightening sign of divine or demonic punishment, whether present or future. When patients arrived at the hospital, they shared similar stories of shame, embarrassment, ostracism, and limited opportunities. But, as they left following surgery and a short recovery period, patients and their caretakers, usually mothers, spoke of going home to a “normal” life, of going to school, of playing with friends, of not being mocked. They realized words like “useless,” “deformed,” and “ugly” would no longer be pronounced over them. What was a defining stigma had become, for many, an opportunity to give thanks to God—Jehovah Rophe—for healing. The saga that follows, of Machiek and his mom, is just one of dozens that could be shared. Their dramatic tale represents far more than a new smile for one person or even 50-some individuals. It offers hope to all the people of the still fragile nation of South Sudan. When the boy was born he was given the name Machiek, meaning “deformed” in the Dinka dialect. It was a descriptive but unkind way to highlight his bilateral cleft lip and the misunderstandings surrounding it. Aluang brought Machiek a long way for the surgery that would transform his life. His mother, Aluang, was among those who called him that terrible name. She loved him enough, though, not to leave him in the bush as an infant, a practice not unheard of in the country. Machiek grew tall, as many Dinka do, as the years passed. Other children mocked him; he got into fights; he stayed to himself. “He could not play with other kids because they would make fun of him,” his mother said. Then, a glimmer of hope appeared on the horizon. Aluang’s niece had cleft lip surgery through Samaritan’s Purse last November. The operation was a success. Aluang saw the results and decided to attempt the journey from Jonglei State to Juba for her son this year, if possible. It wasn’t long afterwards that a series of terrible events began. Her family’s cattle were stolen. For this Dinka family, that was everything. Then their village was burned in the violent conflict that followed (and continues) on the heels of December’s political turmoil in the capital. Aluang and Machiek and their family had to flee to the bush and have been hiding there ever since. Nonetheless, a local doctor in Panyagor somehow got word to her that Samaritan’s Purse would once again conduct surgeries in Juba and fly recommended patients in from remote areas. She and Machiek, now 15, walked two days to the airstrip. That’s faith, hope, and love in action, especially considering that many in South Sudan say it is not worth messing with heaven’s decree to try and fix an “ugly” child. The mother, son, and a baby sister (still nursing) were picked up on November 2. Everything was new to them. They had never been on a plane, never been to Juba, and never undergone a major surgery. A medical examination cleared Machiek for his operation. November 3 would be the big day. Machiek examines his new look after the operation. When Machiek was gently placed on his recovery bed after the operation, his mom was clearly concerned. He had a fairly severe cleft and the surgery had taken a little longer than some others. He was also still out of it, due to the anesthesia. Aluang had little understanding of modern surgery. Was her boy sick, or even dead? The nursing staff assured her that Machiek would soon wake up. He did and, a little while later he tentatively ate a little lunch. Finally, Aluang took her first bites that day too. As Machiek got stronger, he began looking at himself in a mirror provided by the medical team. He was obviously fascinated by his new appearance. He did not say much, but his mother was excited for him. Huda, the first cleft palate patient ever in South Sudan, and her father, Mohammed, were flown home to Yida. 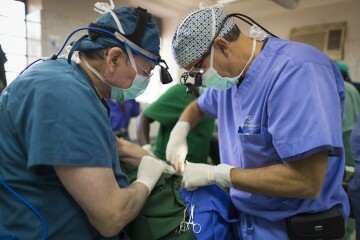 The next morning, the cleft lip program’s chaplains—local Christian men who are studying medicine as a platform for future missions endeavors—came in to give the patients’ new names. Every one of the first group of patients had a name similar to Machiek. Pastor Robert spoke and prayed over the boy to begin the renaming ceremony. He referenced Psalm 139:14—“I will praise You, for I am fearfully and wonderfully made”—and told the teenager, “God created you in His image.” He instructed him not to accept the name Machiek in the future and gave him the good biblical name of John. It was a capstone moment amidst a whirlwind of change. Before leaving, Aluang spoke of her hopes for John’s future. A country at peace was near the top of her list. More education for her son was right up there too. Though he’s 15, John is only in the second grade. For the bush of South Sudan, it’s a good start, nonetheless, and despite significant challenges, there is every reason to hope he will have opportunities his older relatives did not. There’s one less thing John has to worry about now. He has a new smile and a new identity. A cleft lip will no longer define him; he will be integrated into society. Rather than an omen of evil, his smile points to a brighter future.